As the setting Nairobi sun added an extra orange tent to the thousands of already rusty brown roofs in the Mathare Valley, hundreds of fans stretched the thin tin walls of football halls throughout Africa's second largest slum. 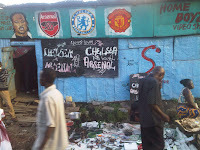 Sporting blue and red colored shirts and jerseys, each one paid 30-40 shillings (~50 cents) to watch a 21 inch screen broadcasting one of the most anticipated matches of the season: Arsenal versus Chelsea. Walking with CT United members for the entire 90 minutes of the match, from one football hall to another, I realized that this is how a community often without TVs and almost entirely without cable participates in Kenya's favourite pastime time. Every single one of the seven 20' by 30' halls we visited was overflowing with grown men, squeezing together on the shaking wooden benches in order to get a glimpse of Drogba squeezing a volley into the top right corner of the net within the first 8 minutes of the match (video here) or Arshavin's near equalizer that was denied by Cech's outstretched left foot. While cheers from Chelsea's side and gasps from the Arsenal fans only made the place a few degrees more stifling, the hall managers were sweating nervously, praying to avoid the blackout that had already left the other side of town without power. more sustainable as a CBO and simultaneously unite the community and help provide employment opportunities for our young squad. 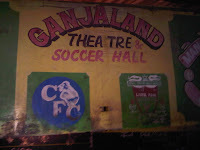 And visiting the halls confirmed what the players have been saying: a state of the art football/movie hall in a less saturated part of the slum (where we could charge slightly more and wouldn't steal customers from the other halls) could be the perfect solution. As the players discussed over Fantas and Coca Colas, this hall would certainly be a football fan's dream, with a 10' by 10' projector, surround sound, padded chairs, high powered fans, generators for blackouts, a refrigerator with snacks, a VIP row for advanced ticket holders, a second screen to show concurrent matches, and first class customer service. Extravagant? Perhaps. 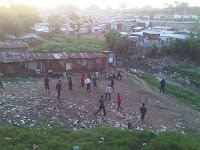 But why shouldn't Mathare have the same luxuries one would find on the opposite side of town, but at an affordable rate? As Acumen's CEO often states, poverty is about choices, and if you find a way to provide the poor with more choices, you are exploring opportunities to establish dignity and creating a stepping stone towards alleviating poverty. Hmm, what do you mean by where is their story? As far as their livelihood, most of the members depend on their guardians, although they've been looking for ad hoc projects around their homes in Mathare. And most of the CT management team are trained as VCT counsellors, which provides some income.